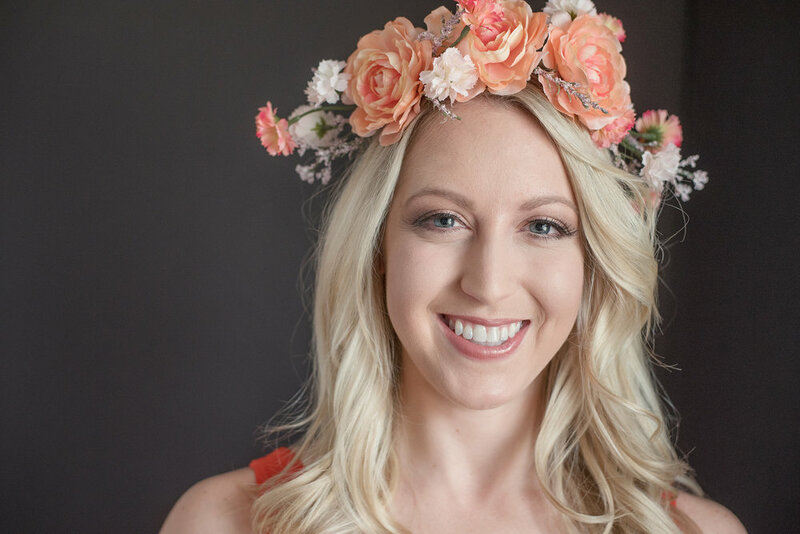 Do you love the idea of walking around in a flower crown or having gorgeous photographs taken wearing one? I will show you how you make a flower to use for whatever occasion you would like. What do you need in order to make a flower crown? Flowers are the obvious item needed. You can get flowers from the dollar store or from a craft store like Joann or Michaels; the flowers I got for these crowns are from Joann. You will want to get a variety of sizes for your crown. I picked up two different sizes of blooms, but you could always get more sizes. In addition to flowers, you will want floral wire, floral tape, hot glue, needle nose pliers, and wire cutters. The first thing to do after you have all of your supplies is take the wire and make a circle large enough to fit on your head. You can make it so it sits on top of your head like a typical crown, or you can make it larger so it goes over the top of your head and down the sides. You will want to cut the wire bigger than the size you need it so that you can overlap the ends and twist them or hook them together. To do that, you will need to use the needle nose pliers to wrap one end of the wire around the other end. If you prefer the hook method, you can make a J-loop at each end, hook them together, and then pinch them closed with the pliers. You will want to pinch the ends as flat as possible so they don’t poke you when you are wearing the crown. After you have the wire base together, you will want to wrap it with the floral tape. You should start wrapping where the ends are joined together, continue wrapping the entire circle, and wrap the ends again when you reach them to ensure they are nice and secure. If you didn’t get the ends of the wire flat enough and you can feel it poking through the floral tape, wrap them a few more times until you no longer feel it poking. To get the floral tape to stick to itself, you may have to press hard and rub it together. It will eventually stick. 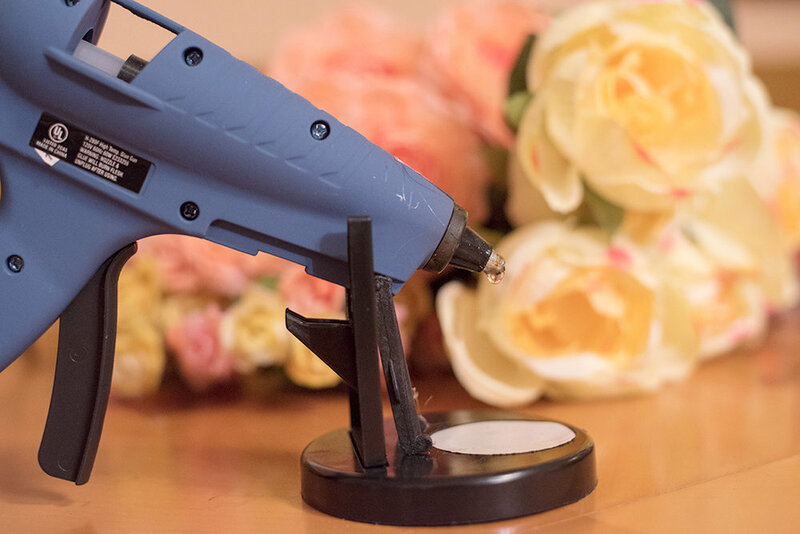 Now you want to plug in your hot glue gun and turn it on so it’s nice and hot when you are ready to start gluing flowers on. After you have that warming up, you will want to start taking the flower blooms off their bouquets. For the larger blooms, I pulled the flowers right off their stems. With the smaller blooms, I used the wire cutters and cut the stems so they were 1-2 inches long for each little cluster of flowers. Start with putting the sprigs of smaller flower clusters on to the prepare crown base. You can either attach them with hot glue or floral tape. I chose to use floral tape for these small flower clusters, as it ends up smoother and more secure than using the hot glue. I first put two sprigs together pointing the same direction and wrapped them onto the wire with the floral tape. After that, I held up one of the large flower blooms to figure out where I would like it placed and where I would like the small flower cluster on the other side of it to go. Once I was happy with the placement for the small bunch, I put down the large flower and I attached the small sprig to the crown with floral tape. After I had those sets of small flowers attached to the crown, I attached the large bloom. To attach the large bloom, I turned the flower upside down and put hot glue where the stem used to be. I then put the flower on the wire in between the sets of small flowers I already attached to the crown. I then put more hot glue onto the flower where it was touching the crown wire to make sure that it was firmly attached to the crown. You will want to hold the flower and wire until the hot glue has cooled enough so that the flower doesn’t move. If you set it down while it’s still hot, the flower might rotate on the wire and no longer be in the exact position you wanted it in. Now you will just repeat the previous two steps and attach as many flowers as you would like until you have achieved the desired look for your flower crown. You may also want to pull some of the small flowers off of their stems and glue them on to parts of your crown to fill in any bare spots. Now you have a fun flower crown to wear to a special event or for photographs. Show me some of your flower crown creations; I would love to see them!